The doldrums have hit big-time for me this month. The creative muse, which was so prolific through the past few months, appears to have taken a leave of absence. The few days that I've had off have been spent mostly at the computer or sitting, vegeing (how do you spell that, anyway?) out in front of the TV watching movies on Netflix. Here's a look at some of the projects that are overwhelming me at the moment. 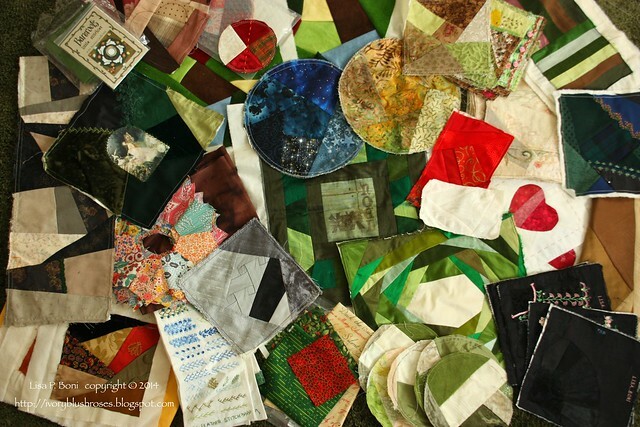 First there are the Crazy Quilting projects. I have always had a huge unfinished handwork basket, but it seems to have grown exponentially this year, despite doing my best to finish up some old things. As much as I love participating in round robins, I think I need to focus more on my own work this coming year. The trick is staying motivated when there are no deadlines! Then there is the seemingly never ending Family Cookbook project. The latest part of this has been going through my mother's cookbooks (4 1/2 boxes worth!) to find some of the recipes that we wanted to include. Things she made all the time, but weren't in her recipe boxes. 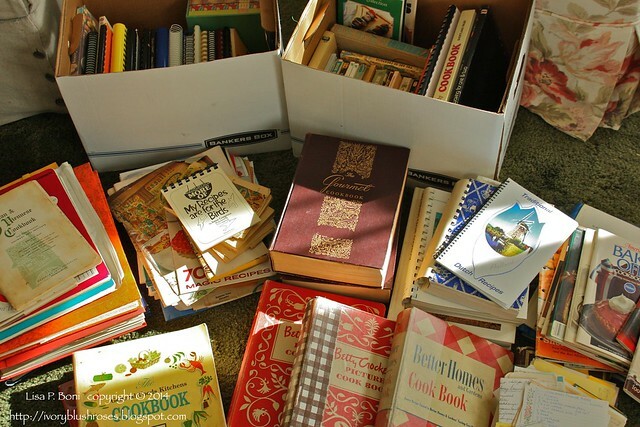 Needless to say, it takes time to carefully scan through this many cookbooks. And in the process, we found still more recipe boxes to go through. 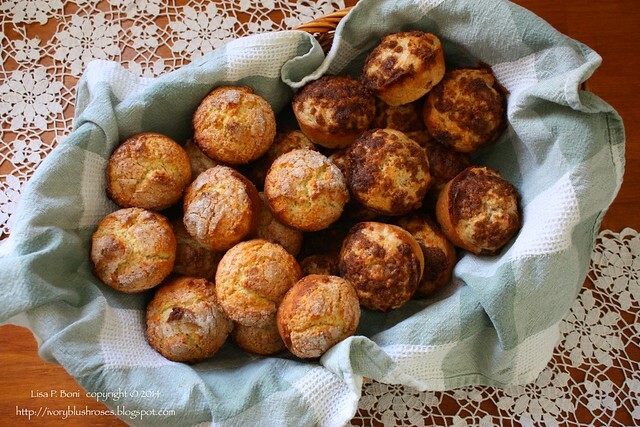 There have also been many e-mails to family members asking for specific recipes to add, reminders, and then inputting all these recipes into the same format that can be used in the cookbook. There won't be a lot of photos in the cookbook, but I wanted a few for some of the header pages, so that involves making the item and setting it up for photography. I love this part of creating the cookbook! I had hoped to have this cookbook finished in time to give as Christmas gifts this year, but it's not going to happen as there is still far too much to do to complete it in time. Then there are the other book projects I am working on. I just completed putting the 2013 entries for my blog into book form. 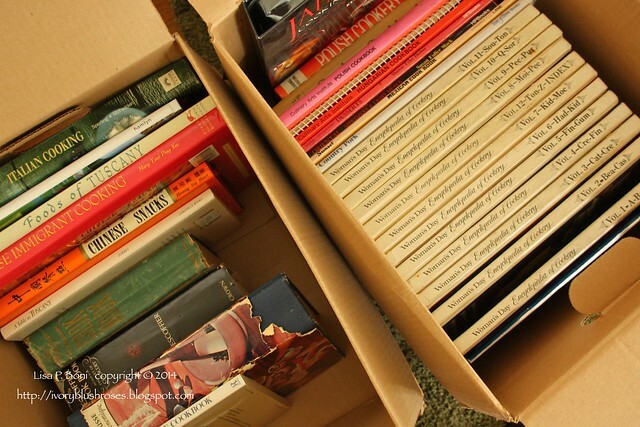 Those are easy books as they are usually just a matter of cutting and pasting. But I'm also working on two or three other book projects and each of them involves writing or compiling different writings into one cohesive format. 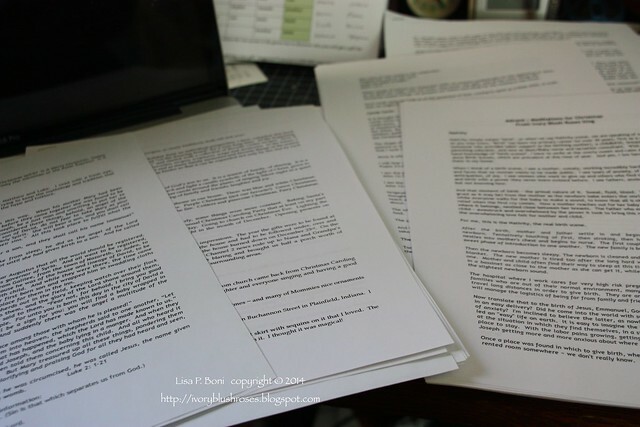 So there is lots of proofreading and re-writing happening. 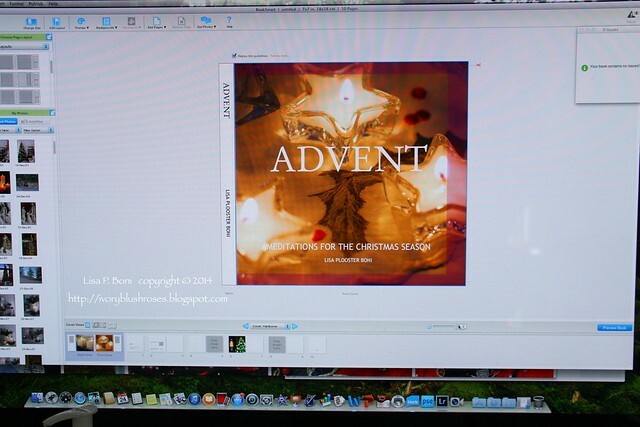 One of the books is a Blurb Book where I am compiling some of my blog's Christmas/Advent meditations (and adding to it). I had also hoped to have this one done and available for purchase prior to Thanksgiving, but it looks like it will take me most of December to complete it. I'll keep you posted on when it will be available! With my daughter's marriage this summer, I now have a mostly empty room on the main floor of my house. I'd love to move my sewing room up here from the basement. Right now, Miss Kitzy Cat is the primary resident of this room and she rarely leaves it, so it will be good to have me using the room too so that she gets more attention. Since we painted the room when we moved in, I don't really want to repaint at this time. I must admit that grey is just about my least favorite color (orange takes the top disliked color spot). I just find it depressing, so it's a bit of a challenge to figure out how to use the grey but make it a happier/peaceful place for me. I'm debating on using soft pink and yellow with it, or going with green, brown and white for a soft woodland theme to the room (which is what I'm strongly leaning towards at the moment). 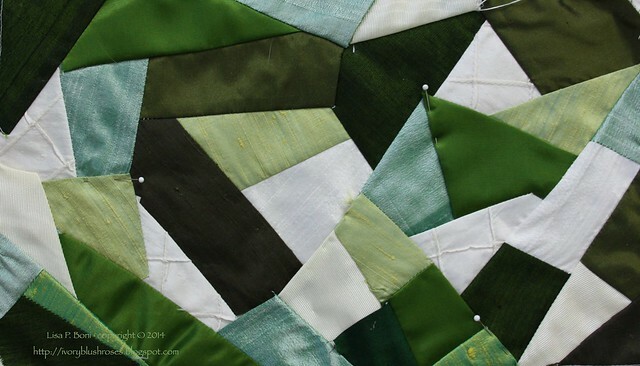 I want to make some crazy quilted curtain tiebacks to provide the room's focal point ~ yet another project! 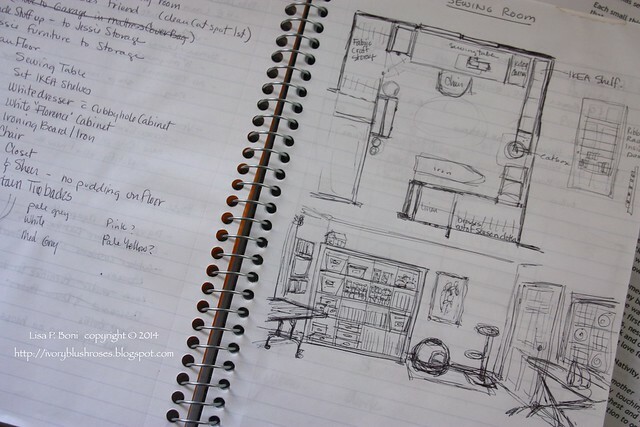 I'm such a visual person, that any room change involves lots of sketches and floor-plan ideas, as well as tons of lists. The goal is to get this room together by the end of December. Jessie still has to pick up some of her furniture and pack up some things in the closet. Once the new sewing room is complete, then I'll have the old sewing room in the basement to turn into a fabulous guest room for when my Sister and her hubby come to visit! 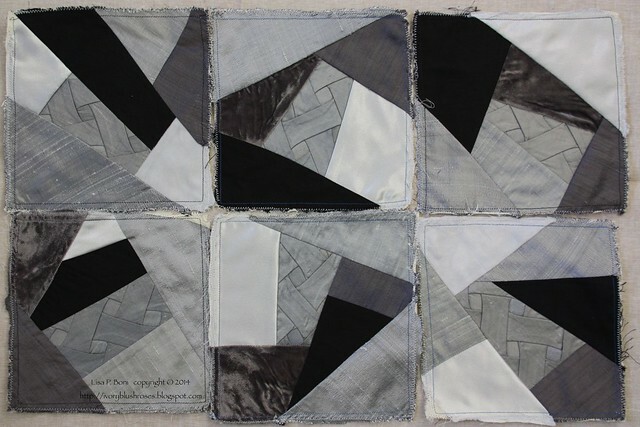 That will be yet another project, also with another crazy quilt project to be completed as the focal point for that room! Another thing that probably has slowed the creative muse down at the moment is the total chaos of my studio stitching space! It went from a creativity inspiring mix to suddenly out of control! When the sewing room gets moved upstairs into Jessie's old room, all of this will become part of that room. Then I'll have my painting studio back, which I'm really looking forward to as I've been missing having access to my easel! I did manage to get blocks made and sent out for two new round robins. This set of grey blocks will eventually be for my daughter and are going to be embellished in a Steam-Punk theme! I made this piece thinking I might use it for my Christmas card stitchery. But then I decided to do something different, which isn't going to happen in time anyway, so I decided to remake it into my Mini DYB Blocks for another round robin. I cut them up in to triangles to create a wintry woodland themed bunting to hang from my mantle. I will add some semi-ciruclar flags as well. 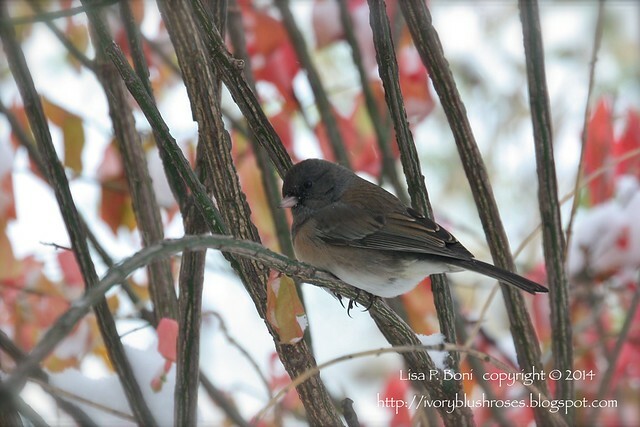 The juncos finally arrived a couple weeks ago and within 24 hours there was cold and snow! Winter must truly be here even though the calendar still says it is autumn! I love having them though - such pretty birds! And I just realized that with the Holidays upon us, it's time to put away the fall decor and decorate the house for Christmas! There are a few Christmas gifts in the works to finish up as well. Where the time will come from for all that needs to be done, I have no idea. My work schedule is absolutely crazy these days with extra training that we've been doing and the need to complete two different certifications before mid December, not to mention all the usual household and yard upkeep that needs doing. No wonder I'm overwhelmed! Guess that means it is time to make the best of my ONE day off this week and go be productive. 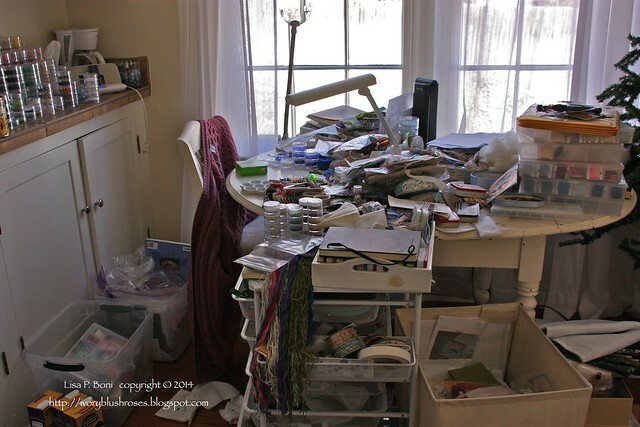 I think I'll start by cleaning my stitching studio. I think most of us have been in your shoes. The creative mojo runs away and is hard to find. But when you least expect it, it will come knocking on the door again. And your work space looks very similar to mine. I tell myself it is the sign of genius. After all, have you seen pictures of Einstein's desk? My little studio (aka a small bedroom that also has a pullout couch for guests) looks pretty much exactly like yours and I do know how overwhelming that can feel. I can work quite happily in a mess for so long and then everything has to stop while I clean up. The clean up stage generally happens when I've put something down and then can't find it. Totally understand. I always have so many things I want to do and that becomes a distraction from doing just. one. thing. at. a. time. 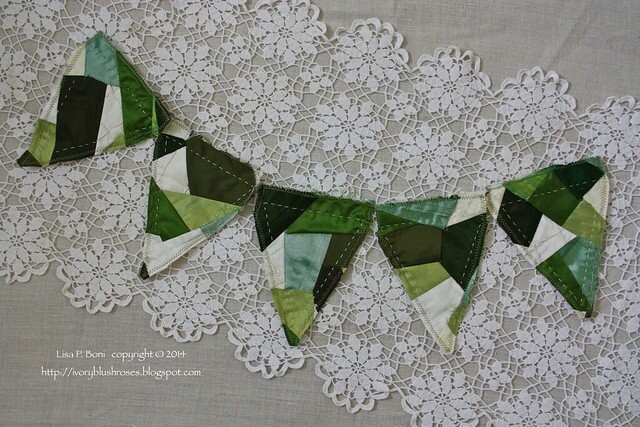 Love the bunting project. Who am I kidding? I love everything you create, Lisa! You do more than 10 of us! Cut yourself some slack (sewing metaphore) looks like next years gifts are all lined up ;) Hope you have a restful thanksgiving day. I follow your blog quite regularly and am amazed by what you accomplish - so much in a busy life. Don't criticise yourself for what you don't manage to do, rejoice in your creativity and enjoy all that you can do. I'm sure that you'll get to the rest eventually - that's what I keep telling myself about all my unfinished projects. Yes, untidiness has a lot to do with it.....gazing despairingly at her own space as she writes these words! And probably not taking on any more RRs BUT and this is a big BUT, Lisa.......do not despair, those monthly pincushions are a delight and an encouragement to all of us, you have an RR finished and hanging, you had a wedding and a huge amount of home improvement earlier in the year beautifully completed so........a lot was achieved, dear Lisa! I think you are putting too much on yourself. You have had such a wonderful year with your house and the wedding that all else should just fall aside and just pick something that makes you happy to work on. The others can wait. sometimes we need to power down so we can get creative again - you've been running on all cylinders this past year between getting your house and yard ready for the wedding, your job and your projects. Your creativity just needs down time! 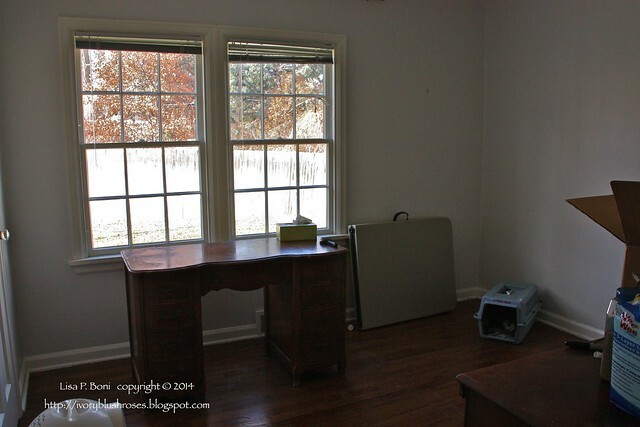 Looks like you'll have a great sewing room soon! I'm like you, I need my work space neat before I can be productive - I bet once you do that, you'll be all set.